My nephew Marcus is 2 today! I decided to make some cupcakes to take with us when we go to see him. I just used a standard sponge recipe with butter icing on top. I decorated them with writing icing pens. It was rather tricky. 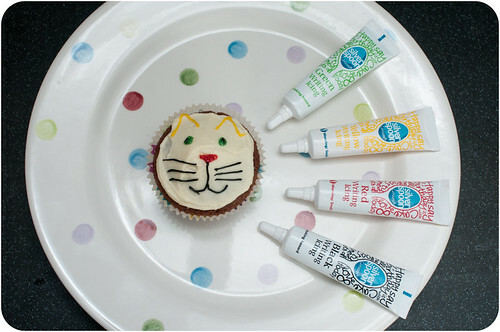 I have very shaky hands, especially when squeezing the tube so my kitties are all a bit wonky. It was fun though. 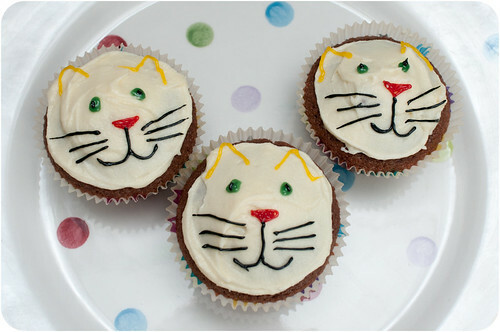 Could I have your permission to use these in an upcoming Cat Cupcake Tuesdays post? I will give you credit, and link back of course! Yeh sure, if you think they’re good enough!! Beautiful, decorative cupcakes for your nephew. I am sure he will never forget this birthday ever!!! I love the faces you had drawn, very adorable and creative!